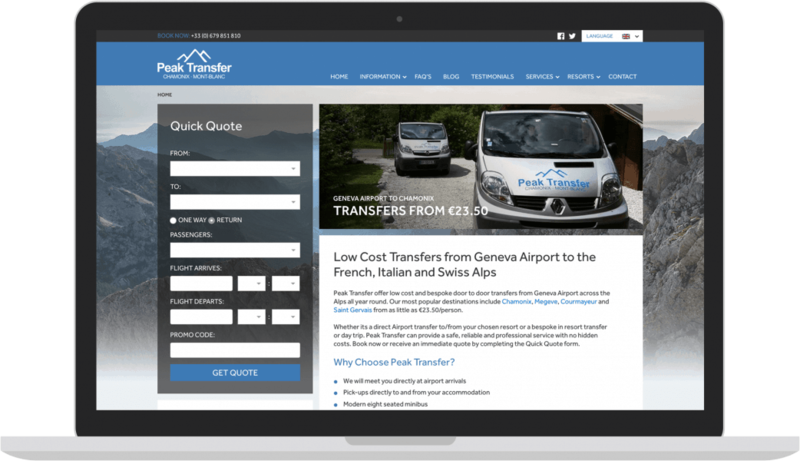 Peak Transfer provide low cost and bespoke door to door transfers from Geneva Airport across the Alps. 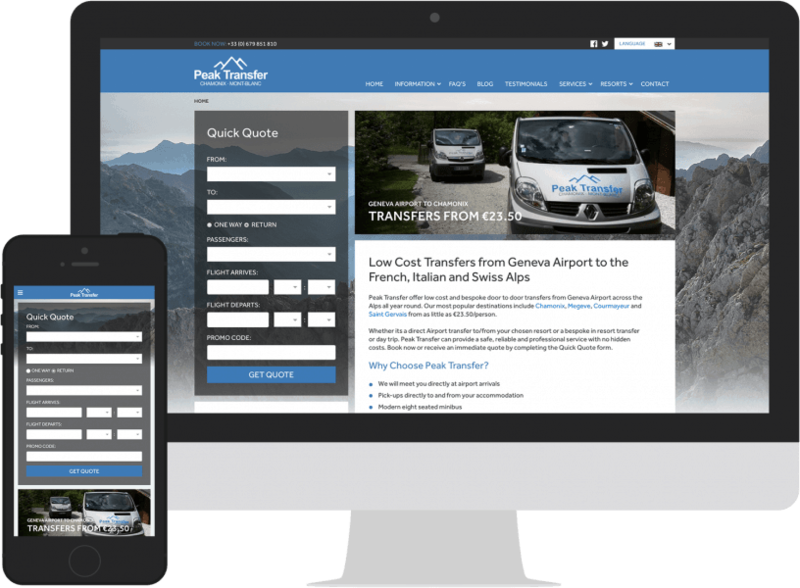 For this project we provided a complete redesign and development of their customer website. 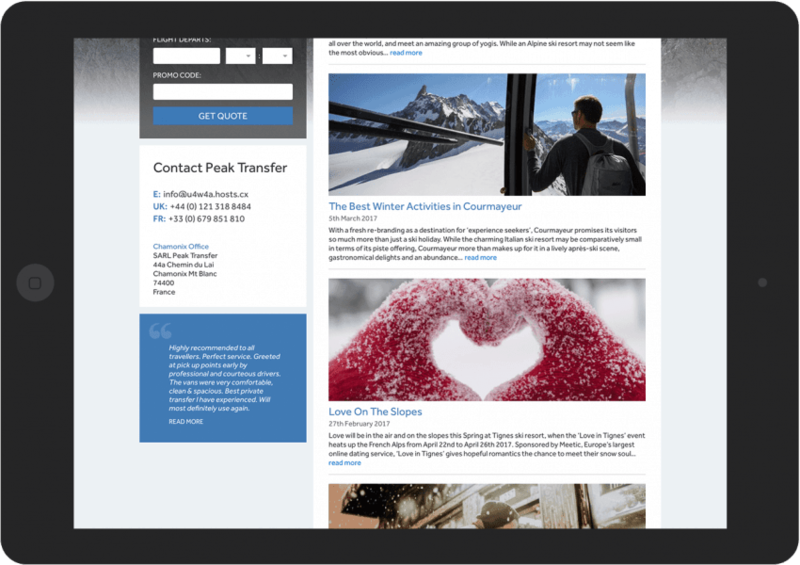 In a competitive market, the new Peak Transfer website needed to standout. Designed with a refined yet familiar UX, our new concept took the companies existing branding (including logo and colour palette) and updated it to a modern layout that created consumer confidence in their service. A key part of the design is the booking form, which is the main capture point of the website and needed to be very clear and easy to use. With the form aligned top left in a familiar area, the website is built around this feature with fantastic font library from Adobe Typekit as well as the companies own imagery. The website front-end sits on the popular WordPress content management system, which in itself has completely custom field-sets for the client to update and create new content, vital for both ease of use and search engine optimisation in the future. For this project we also provided our framework to the booking system developer for total integration, this meant that our code also needed to be clearly annotated in order for the third party to complete their work efficiently. The result is a beautiful, modern and easy to use booking website that will remain competitive for many years ahead. Great service, great web design also very creative and helped me out loads from start to finish. All round great service like this is very hard to find in the IT world.